A couple more snippets from Art in Theory. Just got this from Amazon a couple of days ago and I'm pleasantly surprised. I read a book by Harrison and Wood from the library some years ago and my personal verdict was "No." So it took a long time to get around to buying this, and the scale was finally tipped by a recommendation from an OCA friend. I looked at it in dismay, paged through the Contents (18 pages) and wondered how to tackle it. Dip in here and there? Or begin at the beginning? I could never read it all, but eventually I decided to begin at the beginning with a flexible approach, skipping without guilt anything that's too boring or tedious or incomprehensible. 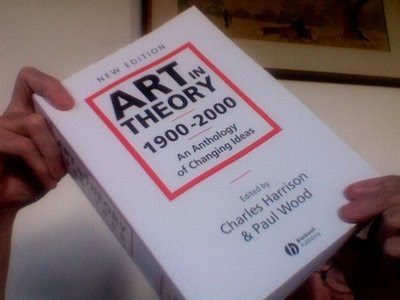 The book, 1248 pages, consists of extracts of texts on art theory. It's similar to and complements Theories and Documents of Contemporary Art (1945 to the mid 1990s) but it covers a broader time frame (1900 to 2000). I'm pleasantly surprised because there are so many painters here and lots of interesting stuff that I haven't seen before. There are many theorists and philosophers as well of course, especially later in the century. As I plod through it, I'll post the odd quote here and there. "We affirm that the emotions or states of the soul provoked by some spectacle, create in the artistic imagination signs or plastic equivalents capable of reproducing these emotions or states of the soul without the need to create a copy of the initial spectacle; that each state of our sensibility must correspond to an objective harmony capable of being thus translated." 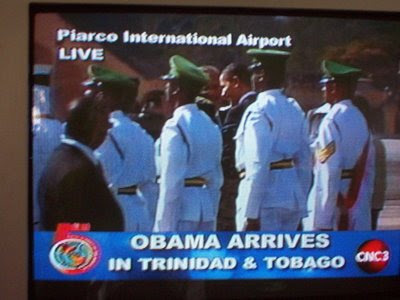 President Obama arrived half an hour early this afternoon along with several other world leaders for the Summit of the Americas here in Port of Spain. The blurred photo isn't the fault of the camera, it's because I had it on the wrong setting and everything was happening so fast. "The love of his art caused him to be always provided with the materials for drawing and etching, so that we have these transcripts of nature fresh from the fountain head. We know this from an anecdote mentioned by Daulby. In describing the etching of "Six's Bridge," in his catalogue, he says, "This plate was produced by an incident which deserves to be related. Rembrandt lived in great intimacy with the Burgomaster Six, and was frequently at his country seat. One day, when they were there together, the servant came to acquaint them that dinner was ready, but as they were sitting down to table, they perceived that mustard was wanting. The Burgomaster immediately ordered his servant to go into the village to buy some. Rembrandt, who knew the sluggishness of the Dutch servants, and when they answer austons (a-coming) they are half an hour before they appear, offered the Burgomaster a wager that he would etch a plate before his man returned with the mustard. 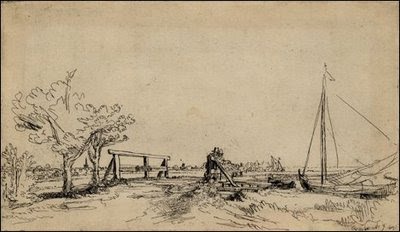 Six accepted the wager, and Rembrandt, who had always plates at hand ready varnished, immediately took one up, and etched upon it the landscape which appeared from the window of the parlour in which they were sitting. The plate was finished before the servant returned, and Rembrandt won his wager. The etching is slight, but it is a wonderful performance, considering the circumstance that produced it." It is not wonderful on account of the rapidity with which it was done, but the genius and science that pervade every touch, not only in the general arrangement, but in the judicious management of the smallest darks; they are all in the most effective situations. When the plate was bit in, the name was left out; it was afterwards added with the dry point; also a little shading was given to the hat of one of the figures on the bridge, which in the rare state is white." And to think, it was 200 years before Impressionism. Small pieces of cardboard can be used to paint on and I rescue them whenever I can. 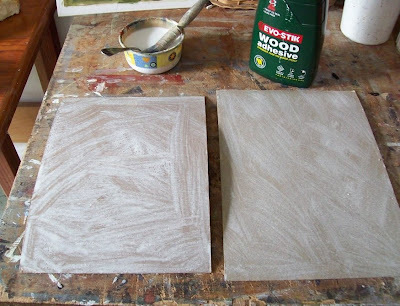 I've primed these with a thin coat of glue (white glue mixed 1:1 with water) and now they can be used for any medium including oils since the priming seals the surface and prevents paint from being absorbed into the cardboard. The glue looks whitish and semi-opaque when wet but is transparent when dry. The one on the left is bowing with the wet glue but the card is thin and pliable and can be mounted on something else if the work is worth keeping. If preferred the priming can be done with acrylic gesso instead which gives an opaque white ground. I like having a few of these around ready-primed. Being cheap, not to mention virtually free, one doesn't feel inhibited or afraid of wasting materials when using them. These are ordinary grey cardboard. The brown corrugated cardboard can be used too but it isn't quite as good. MY LISTINGS, INFO & ARTWORK ON . . .
10 Lessons I’ve Learned from Henri Matisse - Color! Why you decide to be an artist? Is this a Learning Log? Assignment 2 - Creating mood and atmosphere. Copyright © Mary Adam unless otherwise indicated. All rights reserved.